Children will begin to explore the world of robotics as they build simple animal models that teach the fundamentals of robotic design. 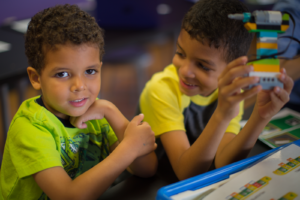 Whether learning about sensors while building a fish or alligator or discovering ways that gears and wheels and axles create movement while building robotic dogs or frog, your child is sure to have a great time! 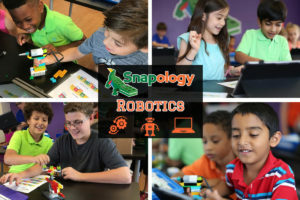 In Snapology’s Mega Machine Robotics class, your child will create some of their favorite motorized vehicles. Students will learn about gear ratio, sensors, pulleys, cranks, and programming as they build trucks, space rovers, helicopters, and much more. Your child is sure to have fun as they build, learn, and play. Come build super-cool cars, catapults, and parade floats that use gears, axles and pulleys. Work in teams under guided instruction to build a different model using LEGO® bricks each week. This class is designed for children of all ages and building abilities to build together. Classes include free-building time to promote creativity. Design your own amusement park in this super fun program! Learn how to use LEGO® bricks and other building materials to make coasters and other awesome rides. Can you design the next Disney World? To the Batcave fans! Design your own superhero using LEGO® bricks, create your own adventure and comic strip. Have a blast as you create your own fantasy world of superheroes. What kind of super powers do you have?